I was very busy for the past two months so this blog just didn't move. As you may know, the LED dot matrix display is my favorite device. 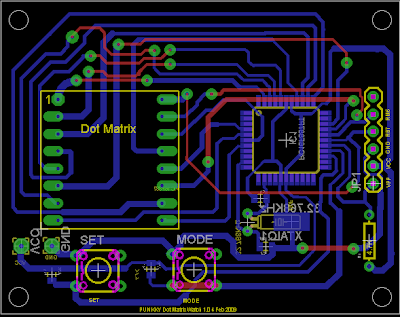 I have designed a small development board for testing my led dot matrix related programs. 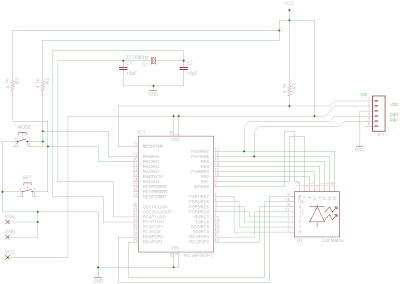 Acutally, I made a PCB and installed all components but the board didn't work :p. It was working when I tested the schematic on breadboard (with through hole version of PIC16F887). I think the SMD PIC16F887 may be broken or the PCB is bad but I just don't have time to figure out the problem. I will try new PCB and PIC16F887.